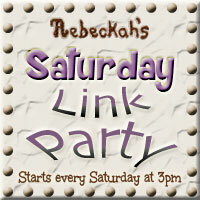 Welcome to Rebeckah's 10th Saturday Link Party! Our first feature this week is this beautiful "Abby's Scarf" by Amber of Devine Debris. One can never have too many scarfs. They are pretty, practical and will always get much use and love. I love the lacy airy look to this design. Thanks for sharing your new scarf pattern with us Amber! *Click on the project title or image to be directed to the free crochet pattern. Our next feature this week are these creative "Nil Mal Crochet Coasters" by Erangi of Crochet for you. Coasters always come in handy as they are very practical and widely used year-round. Just because they're practical, doesn't mean they can't be pretty too! I love the use of two colours and how easy the pattern is to follow. Thanks for sharing your new-old coasters with us Erangi! Our last feature this week is this darling "Amigurumi Mouse" crocheted by Janice. She used a free crochet pattern by Sharon Ojala of Amigurumi To Go for the mouse and added a red coat with a little flower for a special touch. Thanks for sharing your sweet mouse project with us Janice!